Our commercial round plastic outdoor trash receptacles are great in parks, campgrounds, playgrounds, pools, schools, athletic fields and around your facility. They come in a variety of colors and we can mix and match receptacles and lid colors. Just note what you would like in checkout comments or choose from the standard colors above. 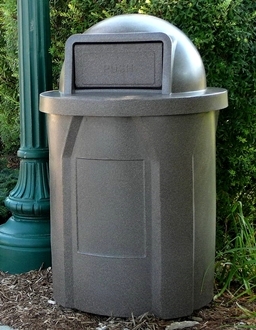 Our trash cans come complete with receptacle, dome top lid and heavy duty plastic liner with handles. Please see below for colors and specs. Product is manufactured when ordered to keep costs low and offer you a competitive price so please allow a 3 to 4 week lead time. Colors: Blue, Brown, Green, Black, Orange, Red, White, Yellow, Dark Granite, Light Granite or Beige Granite. Trash Can Dimensions: 25 inches diameter x 37.5 inches high. Lid Opening Dimensions: 11 3/8 inches wide x 5 7/8 inches tall. 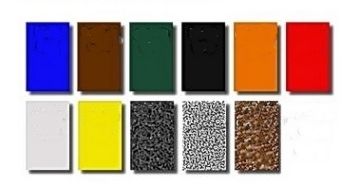 Trash Can Colors: Blue, Brown, Green, Black, Orange, Red, White, Yellow, Dark Granite, Light Granite, Beige Granite. Go to top of this 42 gal Round Trash Can, Liner and Dome Top Lid, Choose Color page.